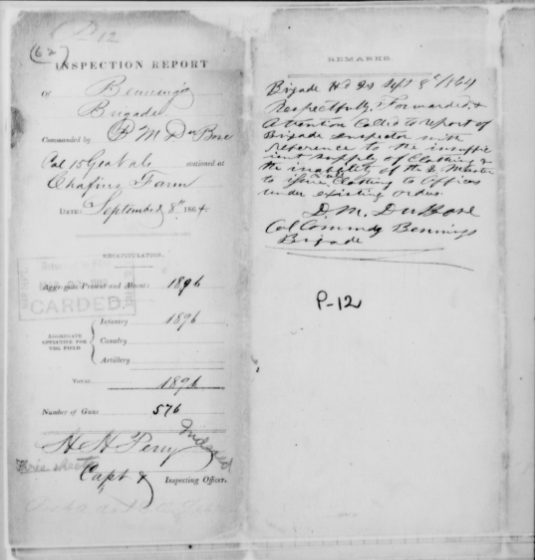 This page contains an index to National Archives and Records Administration Microfilm M935, Reel 10: Confederate Inspection Reports P-12 to 39-P-24. Some of these inspection reports have been transcribed almost in their entirety on my SOPO Store page, with the exception of the absent officers list. If you are a wargamer or researcher and you are interested in the Present for Duty strengths, commanders, and weapons for the sub-units of those units listed here, please Contact Us. I’m willing to provide a transcription of that information in an Excel spreadsheet only for $1 per report. $1 to get detailed information for 1 specific report. $25 to get detailed information for ALL 64 REPORTS. Contact Us to inquire about these reports and get instructions for payment. 4 1-P-17 0069-0093.jpg Rodes’ Division MG Robert E. Rodes 8/20/1864 Bunker Hill, Va.
5 2-P-17 0094-0105.jpg Ramseur’s Division MG S.D. Ramseur 8/20/1864 Smithfield, Va.
6 3-P-17 0106-0122.jpg Wright’s Brigade BG V.J.B. Girardey 8/12/1864 Near Petersburg, Va.
7 4-P-17 0123-0135.jpg Mahone’s Brigade Col. D[avid]. Weisiger 8/15/1864 Wilcox’s Farm, Va.
8 5-P-17 0136-0147.jpg Harris’ Brigade Col. Jos. M. Jayne 8/30/1864 Petersburg, Va.
9 6-P-17 0148-0160.jpg Finegan’s Brigade BG Jos. Finegan 8/16/1864 Petersburg, Va.
10 7-P-17 0161-0179.jpg Terry’s Brigade BG William Terry 8/20/1864 Camp near Bunker Hill, Va.
11 8-P-17 0180-0193.jpg Evans’ Brigade ? 8/20/1864 Bunker Hill, Va.
12 9-P-17 0194-0204.jpg Hays and Stafford’s Brigades BG Z. York 8/19/1864 Winchester, Va.
13 10-P-17 0205-0216.jpg Gordon’s Division MG John B. Gordon 8/21/1864 Bunker Hill, Va.
14 12-P-17 0217-0228.jpg Artillery 3rd Corps ANV Col. R.L. Walker 9/01/1864 Near Petersburg, Va.
15 14-P-17 0229-0250.jpg Heth’s Division MG H. Heth 8/18/1864 Petersburg, Va.
16 15-P-17 0251.jpg-0262.jpg Davis’ Brigade BG Joseph R. Davis 8/16/1864 Petersburg, Va.
17 16-P-17 0263.jpg-0279.jpg Fry’s Brigade Col. R[obert]. M. Mayo 8/15/1864 Petersburg, Va.
18 17-P-17 0280.jpg-0295.jpg Kirkland’s Brigade BG W[illiam]m. MacRae 8/16/1864 Petersburg, Va.
20 19-P-17 0308.jpg-0320.jpg Terry’s Brigade BG W[illiam]. R. Terry 8/11/1864 Near Ashton Creek, Va.
23 22-P-17 0350-0361.jpg Field’s Division MG Cha[rle]s. W. Field 8/30/1864 Petersburg, Va.
25 24-P-17 0374-0386.jpg McGowan’s Brigade BG S[amuel]. McGowan 9/1/1864 Petersburg, Va.
26 25-P-17 0387-0400.jpg Lane’s Brigade BG J[ames] H. Lane 9/2/1864 Near Petersburg, Va.
27 26-P-17 0401-0412.jpg Scales’ Brigade BG [Alfred M.] Scales 8/31/1864 Petersburg, Va.
28 27-P-17 0413-0423.jpg Thomas’ Brigade Col. Thomas J. Simmons 8/29/1864 Petersburg, Va.
30 2-P-24 0467-0481.jpg Butler’s Cavalry Division BG M[atthew]. C. Butler 10/?/1864 Near Dinwiddie C[ourt]. H[ouse]. 31 3-P-24 0482-0495.jpg Butler’s Cavalry Brigade BG John Dunovant 9/30/1864 Burgess’ Mill, Va.
32 4-P-24 0496-0507.jpg Young’s Cavalry Brigade BG P[ierce]. M. B. Young 9/30/1864 Near Dinwiddie C[ourt]. H[ouse]. 33 6-P-24 0508-0516.jpg Wilcox’s Division MG C[admus]. M. Wilcox 9/30/1864 Petersburg, Va.
34 7-P-24 0517-0532.jpg Lane’s Brigade BG J[ames] H. Lane 9/28/1864 City of Petersburg, Va.
35 8-P-24 0533-0546.jpg McGowan’s Brigade BG S[amuel]. McGowan 9/27/1864 Petersburg, Va.
36 9-P-24 0547-0558.jpg Scales’ Brigade BG A[lfred]. M. Scales 9/30/1864 Petersburg, Va.
37 10-P-24 0559-0569.jpg Thomas’ Brigade BG E[dward]. L. Thomas 9/29/1864 Petersburg, Va.
40 13-P-24 0594-0605.jpg Harris’ Brigade BG N[athaniel] E. Harris 9/30/1864 Defences of Petersburg, Va.
41 14-P-24 0606-0617.jpg Wright’s Brigade Col. W[illia]m Gibson 9/28/1864 Near Petersburg, Va.
42 15-P-24 0618-0632.jpg Finegan’s/Perry’s Brigades BG Jos[eph]. Finegan 9/30/1864 Petersburg, Va.
43 16-P-24 0633-0645.jpg Heth’s Division MG H[enry]. Heth 9/30/1864 Near Petersburg, Va.
44 17-P-24 0646-0657.jpg Davis’ Brigade BG J[oseph]. R. Davis 9/28/1864 Rives’ Farm Near Petersburg, Va.
45 18-P-24 0658-0667.jpg MacRae’s Brigade BG W[illiam] MacRae 9/30/1864 Petersburg, Va.
46 19-P-24 0668-0678.jpg Archer’s/Walker’s Brigades BG J[ames]. J. Archer 9/30/1864 Camp near Petersburg, Va.
47 20-P-24 0679-0690.jpg Artillery 3rd Corps ANV Col. R.L. Walker 9/30/1864 Near Petersburg, Va.
48 21-P-24 0691-0711.jpg Early’s Division BG John Pegram 9/30/1864 Camp near Mt. Sidney, Va.
49 22-P-24 0712-0726.jpg Godwin’s Brigade Lt. Col. W[illiam]. T. Davis 9/30?/1864 Waynesboro, Va.
50 23-P-24 0727-0741.jpg Pegram’s Brigade Col. J[ohn]. S. Hoffman 9/30/1864 Camp near Waynesborough, Va.
51 24-P-24 0742-0755.jpg Johnston’s Brigade BG Rob[er]t D. Johnston 9/30/1864 Waynesboro, Va.
52 25-P-24 0756-0766.jpg Artillery Army of the Valley Col. T[homas]. H. Carter 9/30/1864 Waynesborough, Va.
53 26-P-24 0767-0785.jpg Wharton’s Division BG G[abriel] C. Wharton 9/29/1864 Waynesboro, Va.
54 27-P-24 0786-0799.jpg Smith’s Brigade Col. Tho[ma]s Smith 9/29/1864 Waynesboro, Va.
57 30-P-24 0826-0851.jpg Rodes’ Division MG [Stephen D.] Ramseur 10/1/1864 Camp Near Mt. Sydney, Va.
61 34-P-24 0896-0909.jpg Cook’s Brigade BG Philip Cook 9/30/1864 Near Mount [illegible], Va.
62 35-P-24 0910-0919.jpg Cavalry Corps MG Wade Hampton 9/30/1864 Petersburg, Va.
63 36-P-24 0920-0934.jpg ? ? ? ? 64 37-P-24 0935-0946.jpg Dearing’s Cavalry Brigade BG James Dearing 9/30/1864 Near Petersburg, Va.
65 38-P-24 0947-0958.jpg Chambliss’ Cavalry Brigade Col. J. Lucius Davis 9/27/1864 Near Stony Creek, Va.
66 39-P-24 0959.jpg Barringer’s Cavalry Brigade BG R. Barringer 9/25/1864 Near Petersburg, Va.